Product prices and availability are accurate as of 2019-04-16 15:27:15 EDT and are subject to change. Any price and availability information displayed on http://www.amazon.com/ at the time of purchase will apply to the purchase of this product. 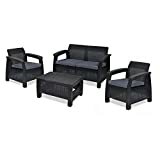 -Bring the comfort to your home with Cloud Mountain 4 piece garden Set. It's a smart way to extend your living area into your yard. 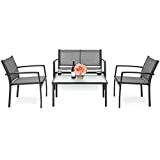 -This outdoor patio set includes a cushioned loveseat, 2 cushioned chairs and a wrought iron coffee table. 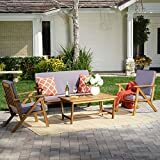 -Each of the plush cushions have 100% outdoor printed fabric material fills with hypoallergenic sponge. Pillows have stain release fabric. -This set is easy to assemble. Approximate assembly time is no more than 30 minutes. Every set has a detailed manual for quick assembling. All required accessories are included. -The frame of this set is dark brown (a bit bronze) color. Max loading weight of single chair was 300lbs. Max loading weight of loveseat was 500lbs. 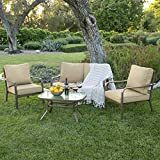 MATERIAL: Wrought Iron Tube, Sponge Filled Cushions, Power-coated Iron Table OVERALL DIMENSION: Single Chair: L26" x W24" x H33"; Loveseat: L47" x W30" x H34"; Coffee Table: L38" x W20" x H19" SET INCLUDES: Cushioned loveseat, two wrought iron single chairs with cushions and a powder-coated coffee table MAX LOADING WEIGHT:500 lbs for loveseat and 300 lbs for each chair Perfect for your patio, backyard, garden and balcony. Eating, gaming or sun bath, meet your need!